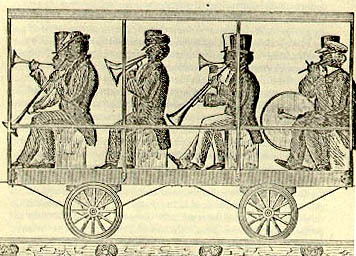 Railways were in use in the United States early in its history. 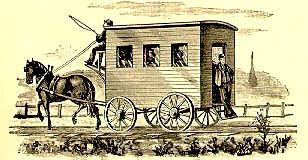 Cars and carriages to transport goods and people were pulled by horses along tracks or sent down hills--and then pulled up again--from the 1810's. Those who recognized the power of controlled steam, though, saw that it was not only for use on the rivers, but also on land. Early in 1825, the Pennsylvania Society for the Promotion of Internal Improvements in the Commonwealth sent an engineer, William Strickland, to Europe. His intention, to collect information on construction of inland navigation systems, focused primarily on railroads. "Locomotive machinery will command your attention," his instructions ran. "This is entirely unknown in the United States and we authorize you to procure a model of the most approved locomotive machine at the expense of the Society." The Stourbridge Lion, an English locomotive, was shipped in 1828; the same year, construction began on the Balitimore and Ohio Railway. Fourteen miles of the B&O were opened for traffic in 1830. Other railways were being built at this time as well, notably the Delaware and Hudson track, where the Stourbridge Lion was tested in 1829. Unfortunately, its first trip was its last; the rails were unable to support the seven ton weight of the machine, although Horatio Allen, its backer, ran it at ten miles an hour along to tracks to "deafening cheers" of the watching crowd. The first practical locomotive built in America was patterened after the ill-fated Lion; with six miles of road ready on the Charleston and Hamburg line, the train, built by Horatio Allen, was shipped to Charleston in October of 1830. During its test run, the Best Friend, as the train was called, promptly fell off the track. Undaunted, the private company that owned the rail ordered a duplicate train, the West Point, which began regular service in 1831. The road was subsequently renamed the South Carolina Railroad. This road was also the site of the famous but very unsatisfactory experiment with "railway sailing" in the same year. While most railroads were financed privately, a few northern states did invest. The Columbia and Philadelphia railroad, begun in 1829, was the first undertaken by a state government. By 1834, the entire track was opened, although power was furnished for a number of years by horses and mules, as it was on many lines, rather than the still experimental steam engine. The most famous of the early locomotives was "Old Ironsides", built by Matthias Baldwin in 1832. 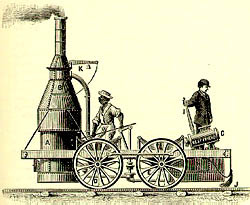 Baldwin had tinkered with small steam engines in his jewelry shop during the 1820's, and finally built a model locomotive that went on display in the Philadelphia Museum in 1831. 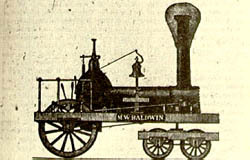 The directors of the Philadelphia, Germantown and Norristown Railroad hired Baldwin to build a full-size locomotive in order to supplant horse power on their line. "Old Ironsides" was built on the basic English model of the day and showed an astonishing thirty miles an hour with a train attached. The Baldwin family continued to build locomotives for decades, following the rise of the Railroad Era. Railroads were slow to begin in the United States. The building of the actual line was often something that happened long before an engine and train were obtained. Initially, the trains were used for short distance passenger travel; the carriages tended to be open with plenty of standing room, and people put on their finery for the unprecedented experience. It was not until the 1840's that the vast impact of the railroad on American and particularly the west began to be felt. 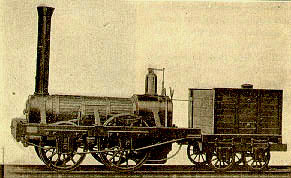 At the time of Alexis de Tocqueville's trip to the United States, locomotives were a novelty item, impractical in the face of waterway travel.